Red Eagle Family CampgroundRecord Owner? Log in. 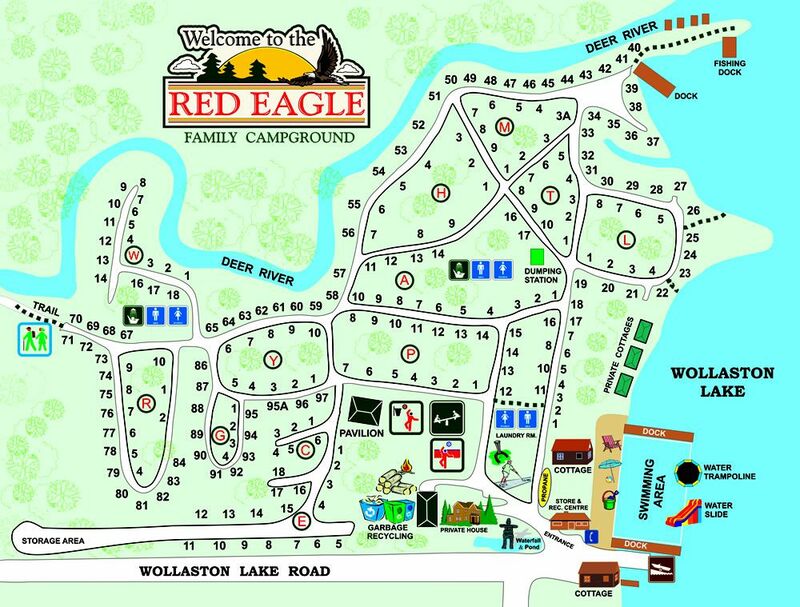 Our Recreation Program has a variety of activities including Xmas in July, Halloween in August..
Have something to say about Red Eagle Family Campground? Fantastic Family-Friendly Cottages/Campground! We stayed in the 2 bdrm cabin this August and we had no complaints about the cabin or the Campground! The cabin looks, smells and feels new and has been kept up impeccably. The air conditioning was a lovely bonus on a hot August week. Not all of their rental cabins have a/c so we were lucky ours did. The kitchen has everything you need to cook and serve food. Everything is thoughtfully laid out and decorated in a small space. The lake is a few steps away from the cabin - the view from the cabin in the morning is great. The 3 bdrm and 1 bdrm cabins have the best views of the lake as they're directly in front of it. The beach is kept very clean and is pet-free (which I appreciate); the lake is beautiful and very clean and they have some fun water slides, a trampoline, and a jungle gym for the more adventurous. There's a little playscape for kids - our 6 yr old loved it. Another favourite part was their Kawartha Dairy ice cream bar! We went on most days for a scoop of ice cream or a slushie. What a treat! They also have laundry facilities right by the rental cabins. The closest major town is Bancroft, which is a 25 min drive. They have a No Frills for your groceries. We hope to be back soon! Thanks for a lovely stay Red Eagle!